We know through user research that people with specialist user needs want to see everything about their specialisms. They want to know when content has changed and quickly understand what has changed. So we’ve made a couple of improvements to sub-topic pages to meet this user need. 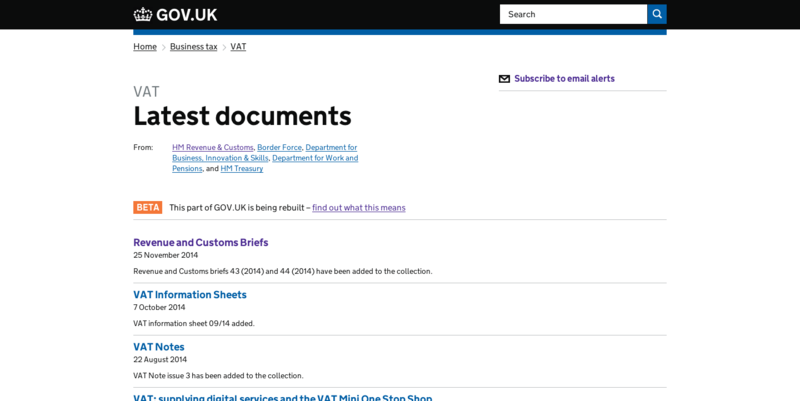 It's now possible to sign up to get email alerts for any GOV.UK sub topic. As we’ve mentioned before, sub-topics are gradually becoming the main GOV.UK subject-based taxonomy. It made sense to add email alerts to sub-topics so users who need to stay on top of changes can easily do so. For a while now it has been possible to tag all 'editionable' content to a sub-topic so this now means most content on GOV.UK is alertable. Our system allows users to select immediate updates, or digests every day or week. change is made to tagged content and it’s marked as a ‘major change’ by the publisher. This email alert will include the change note copy. If you don’t have a sub-topic and there is a user need for one, please get in touch and we’ll work with you to create it. We will also be adding a latest documents page to show what content has been tagged to a sub-topic, and how that content has changed over time. The latest documents page lists content items in reverse chronological order (most recently updated content at the top) and shows the content title and a public change note. The page is generated automatically so no additional work is required by publishers. 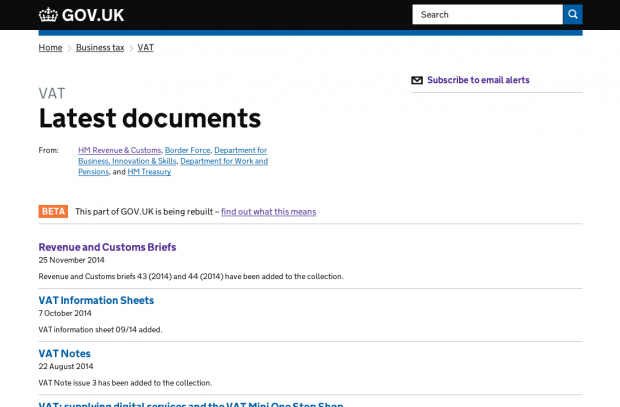 Take a look at the latest documents page for the VAT sub-topic for an example. When we release the sub-topic latest documents page we'll start excluding 'news type items' from the sub-topic page itself, only showing them on the latest documents page. The intention here is to help keep sub-topic pages an acceptable length and stay tightly focused to guidance material, whilst still giving access to news that is related to a sub-topic. A full list of excluded formats is in the guidance document. This is the first iteration of the latest documents page. We’ll be monitoring usage to ensure user needs are being met and iterate accordingly. If you have any feedback about the page, or about the email alerts, please let us know. Hi Ben, this looks good progress and I am sure will help more technical audiences and consultants who need to keep up to date. The 'latest' feed is laid out differently to organisation latest feeds (eg https://www.gov.uk/government/latest?departments%5B%5D=environment-agency shows the document types) - is there a reason or is it just open to iteration? I do like making use of the public change notes. I think having the 'published' or 'updated' words before the date (like on organisation latest feeds) will make the sub-topic latest pages look much clearer; I can't work out why some links have explanatory text and some don't. Could there be a risk that people assume anything to do with the sub-topic will appear in the 'latest' feed, when in many cases it might just be a detailed guide or a collection which then links out to the specific forms and publications? Adding every publication to a sub-topic could make it incredibly long and unhelpful, especially when you often need a collection or a detailed guide to explain the difference between lots of different forms and add some context. I'm looking forward to seeing improvements in access to these sub-topic pages as they are still hard to find. Thanks for your feedback Andrew. You are correct, this is just a first iteration rather than a final design. We wanted to get something released on the live site, partly to assist the transition project, but also to see how this page is used and respond based on that usage. We've already made some changes and there will be more to come, not least to unify the design patterns for page 'types', like the a latest feed. We considered labeling the updates as you suggest (and we may well still add them) but complexity in the system made this harder to do than it should be so we opted to make the page format live, see if this really is a problem, and fix if there is a genuine need. We do expect some inconsistency with regards to change notes and ehrn they are included or not as the vast publishing community of GOV.UK get up to speed with the new feature. I agree, change notes are a good thing to be doing in principle. Thanks for highlighting the missing date stamps. We knew this was going to happen for some formats but it's good to have specific examples to work through. To address your final point, we do want to make sub-topics THE place to go for information or guidance about a subject area. We are very aware that to stay valuable the length and focus of sub-topic pages is really important. I expect to iterate the design to make sure this is the case. Again, we felt it was better to get this released and in the wild so we could see real usage and respond to real feedback. Thanks for again for comments – all really good points. This is good to see and a great step forward but I'm a little confused as to what I will and won't receive when I subscribe to an email alert. Let me explain by running through some examples of why this doesn't really meet the need at the moment and why I will still be relying on my email alert for everything from HMRC. Firstly, it appears I can't subscribe to Business Tax: https://www.gov.uk/business-tax which most closely covers my user need for getting updates to content on Business Tax. Do those without a date still trigger an email? Also, do you get an email for documents that are backdated? During transition I've been subscribed to all updates from HMRC, but do not appear to receive email updates for anything that isn't published and dated on the same date, even though this content has been rewritten onto GOV.UK. 1) Orphaned publications. There are lots of orphaned publications that are not attached to a document collection or to a browse page. These are the hardest to find on GOV.UK. unless you know they are there as it is impossible to browse to them, e.g. Will these be tagged to a sub-topic so that they appear in the feed both retrospectively or in future? Also, so that it is possible to browse to them - a common cause for complaint. Again, will these collections be tagged to a sub-topic so that they appear in the feed both retrospectively and in the future and be findable? However, there have been updates since May 2014 to the VAT notices that are in those Document Collections, but those updates to do not appear either as changes to the underlying document or as changes to the document collection itself. Some collections, such as the Revenue and Customs Briefs, are showing up when documents within them are being updated. This is correct, as Revenue and Customs Briefs can cover VAT, and other business taxes, or even Tax Credits (technically welfare, but definitely not business tax). However, because the collection has to be tagged to all those parent topics that are applicable, it may mean that somebody subscribed to Business Tax (if they could) would get updates to that collection which includes irrelevant topics such as Tax Credits! Again, document collections are the wrong solution for this, and each underlying document should be tagged to the appropriate topic. It is good to see progress being made, but as it stands I can't rely on this feature for my updates from GOV.UK. on a particular topic. Hi Stephen - thanks for your comments. To enable this work we built a new email alert system for GOV.UK, and this is its first application. We felt that sub-topics was the best first usage, but certainly isn't where the work stops. I want to see the system being used for other things in the future. At the moment alerts are generated for items published for the first time and when a significant change is made to a content item in that sub-topic. Again this may evolve if we see a need for it. We felt it more valuable getting this released early, rather than hold back until it was 'perfect'. The same goes for all the new content being created getting tagged. That will take time to embed in as a process. Lots of good things to come. Watch this space. Nobody is expecting perfection, it just isn't clear what user need this release meets if it doesn't actually alert a specialist to the content in their topic of interest. No specialist is going to rely on something that is, quite frankly, so unreliable. Sadly the feed completely missed all the announcements from the Autumn Statement and from legislation day , none of which was tagged to it, but even if it had then I would have seen an alert for the whole collection being tagged to Corporation Tax when only part of the documents were relevant to Corporation Tax. It just seems as though the IA for GOV.UK. is still based on little islands of relevant content lost in a great ocean of content with no map that links everything together.